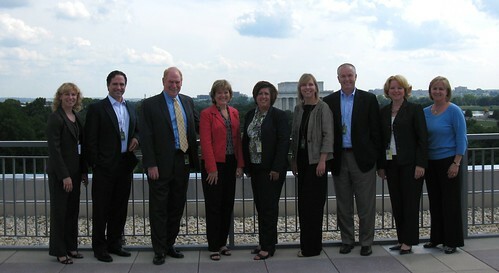 APhA and Procter & Gamble Healthcare Consumer Institute executives on the APhA terrace. On Thursday, APhA staff members participated in a discussion with folks from Procter & Gamble's Healthcare Consumer Institute, a group within P&G that conducts ongoing research of consumers and pharmacists. We spent several hours learning from each other. While the company's research corroborates our own—that consumers truly value pharmacists' recommendations—I thought I would share, with P&G's permission, two key perspectives that resulted from their work. These perspectives suggest that we have some work to do, but that if we do it, the outcomes could be quite fulfilling. "My prescription is fulfilled, but I'm not. I'm not always sure what I'm going to encounter at the pharmacy. I don't know if my prescription will be correctly filled on time. It's such a busy place, I feel like a number there. I feel retail pharmacists are the medicine experts, but I'm not confident I can comfortably ask my questions. If they knew me, they would know my needs and be able to meet them." "I had dreams of making a difference in people's lives. But now my life is so routine. I just wish they understood the complexity and importance of being a pharmacist. Unfortunately, I'm trapped by routine. I'm trapped by the business and feel beat up by patients and the system. I just wish I could help people more." While there were many positive perspectives shared, the two blended "averages" above are important for us to consider. I returned to the APhA staff to commit the rest of my career to helping pharmacists make a difference by becoming increasingly relevant in patients' lives. Expanding opportunities to provide MTM is a key part of that. Challenging pharmacists and their employers to redesign workflow that gets their fingers off keyboards and in front of patients gets us there. Pounding Congress to include us in health care reform as service providers gets us there. The list goes on. If you are reading this, chances are you are one of the pharmacists making a difference every day. But I'm sure you feel elements of the "average" above. Just know that I know and that we're working hard to continue the changes that will place pharmacists front and center in primary care. Please continue to share your stories with me about how you are making a difference. Thanks for reading.